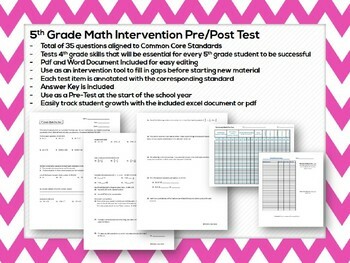 This file includes an EDITABLE pre-test with 35 questions to assess 4th grade basic math skills. 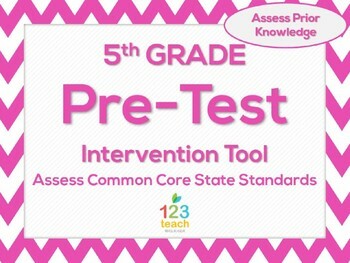 This test covers the essential skills for your students to be successful in 5th grade! You can use this test to determine the level of intervention needed for your students. It is crucial to assess prior knowledge before we begin new material. Give this pre-assessment to your 5th graders at the beginning of the year to get to know your students' math abilities and determine what needs to be reviewed before you can move on to new material. Also included: an excel document and checklist for tracking student progress. Every test item is annotated with the standard assessed. Check out the preview for information. As a Title I Math teacher, I am constantly trying to fill in gaps that my students have. They come into my classroom because they have fallen so far behind in the regular classroom that they have no way to catch up without help. You can use this pre-assessment to quickly identify which students need intervention and what skills need to be improved. Factors and Multiples (GCF and LCM) Powerpoint Review Game Show! © Brittany Kiser. Please note - this resource is for use by one teacher only. 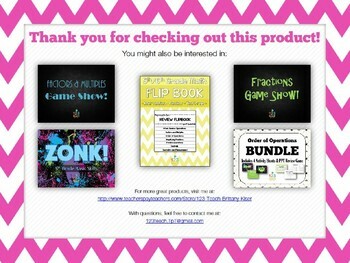 If other teachers at your school would like to use the materials, please purchase additional licenses. Thank you!